The multi-award-winning British vocal group Sons of Pitches return to the Apex on 15 October, with their brand new show: ‘100 Number One Hits’. Expect fast-paced medleys and mind-bending mashups as The Sons of Pitches attempt to hit their target of 100 legendary tracks in just one evening. From Michael Jackson to The Beatles, ABBA to Eminem, the show caters to audiences of all ages. The Sons of Pitches shot to fame in November 2015 when they were crowned winners of the BBC2 singing contest The Naked Choir, hosted by Gareth Malone, as their combination of soaring solos, impeccable harmonies and stunning beatboxing - mixed with a large dose of comedy – captivated the viewing public’s imagination. Looking ahead to their ‘100 Number One Hits’ tour, the Sons of Pitches said: "100 Number One Hits is going to be our biggest, best and most ambitious show yet. Sons of Pitches play The Apex on Monday 15 October at 7.30pm. 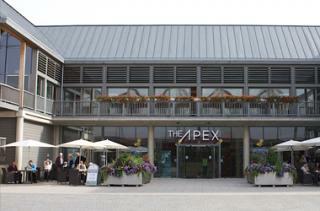 Tickets are £27, ring the box office on 01284 758000 or see the website www.theapex.co.uk for more details, or to book.